the greatest is to be a mother. The loveliest masterpiece of the heart of God is the heart of a mother. Love the shadow picture and love, love, love the quotes! Very nice~Thank you~Love the quote too~JMJ~Lisa S.
Beautiful! And so appropriate during this season of Our Lady's maternity -- and upcoming feastday, too. Thanks so much, as always! Thank you for sharing such a beautiful prayer today!! diddleymaz - Thanks and glad for your daily visits. Anne - So happy to read that. That "shadow" is also one of my favorites. Lisa - Always is a joy to know of those who appreciate/love the quotes. Thanks. Lisa - "season of Our Lady's maternity".....brings a smile to my face....we are so blessed to have her for our mother. Amy - Thank you....it makes me so delighted when others enjoy these posts. oh my . beautiful quotes. the first one: it's not always a right. it's a privelege. the second quote: hope you don't mind if I use that in my sidebar of my blog. thanks! 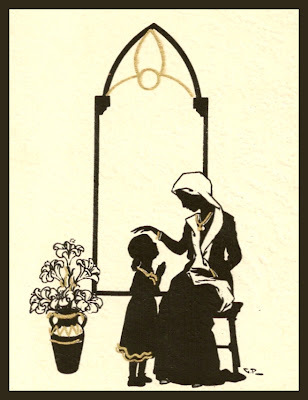 I love the silouette style of the holy card as well. Gardenia - Sure, go ahead and use the quote. I'm happy that the quotes mean something to you. It's always a joy to bring them to others.